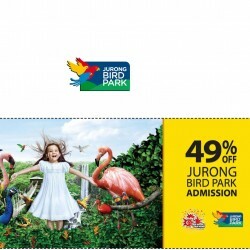 Jurong Bird Park: Enjoy 1 Year Membership at the Price of a 1 Day Ticket! Be a frequent flyer and sign up for a 1 year membership at the price of a 1 day (full-priced) admission ticket, all at the convenience of an electronic membership card*! Simply scan your electronic card (e-card) directly from your mobile device at the park entrance for admission! *With effect from 1 March 2017, the Friends of Bird Park membership will be available in e-card format only. No physical membership card will be issued. This October, bring your family to Jurong Bird Park/ River Safari/ Singapore Zoo! Exclusively for local residents, enjoy 1 complimentary child admission with purchase of 1 full paying adult ticket. 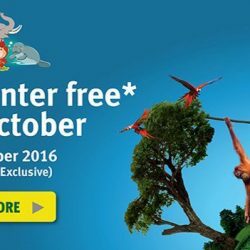 Valid for single park, same day admission, from 1 Oct – 31 Oct 2016. Terms and conditions apply. 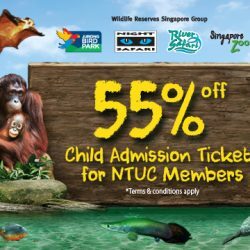 Exclusively for NTUC members, get 55% off Child Admission ticket when you bring your family to Jurong Bird Park, Night Safari, River Safari and Singapore Zoo! Offer is valid till 31 May 2016. 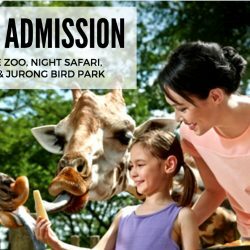 Bring your family to Jurong Bird Park, Night Safari, River Safari and Singapore Zoo and enjoy 20% off Adult and Child admission tickets if you are a NTUC, Passion or SAFRA Card member! Promotion is valid till 31 March 2017. 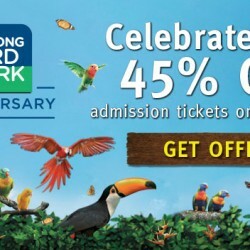 Celebrate Jurong Bird Park's 45th birthday on 3 Jan 2016 and enjoy 45% off admission tickets! 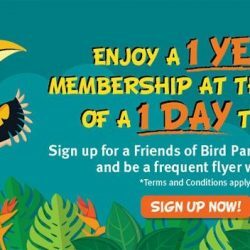 Singapore residents who visit the park on its birthday (3 January, Sunday) will enjoy 45% off admission at Asia’s largest bird paradise. In addition, the first 45 guests will walk away with a goodie bag containing exclusive merchandise worth S$80. For one day only, guests will get to enjoy a birthday edition of the popular High Flyers Show at 11am and 3pm, which promises a spectacular showcase of living colours in the avian world. Some pioneer show birds will take a day off their comfortable retirement to re-live their days as feathered stars and make special appearances.